Find the claw hammer with the design, weight, and grip that’s perfect for your purposes, whether you do light jobs or heavier construction projects. The more you tackle fix-it projects yourself, the more your toolbox burgeons—not to mention your workshop shelves. But when it comes down to basics, a good claw hammer is still the handy person’s must-have; aside from your screwdriver, it’s likely your most frequently reached-for tool, whether driving nails or pulling them for all manner of projects. So it pays to know what to look for in a quality tool. The best hammer feels good in your hand and makes jobs easier, while the wrong one can be hard on your wrist and palm, put your fingers at higher risk of a smash, or even break during heavy use. So we’ve gathered up all the info you need to make the right decision—including three excellent options based on user reviews by do-it-yourselfers just like you. Most hammers have a forged steel head (although you’ll see titanium on pricier models) with either a smooth face or a waffled or milled face. A smooth face is less likely to cause damage if you miss your swing. A textured face, while better able to “grab” the nail, is more prone making a mark if you hit the wall instead of your target. For most homeowners and DIYers, the best hammer is one with a smooth face; those who do a fair amount of carpentry or major construction will probably prefer the extra grip of the milled face. As the name implies, a claw hammer has a cleaved blade opposite the face, which is used for pulling nails. There are two basic types of claw hammers—curved claw and rip claw. 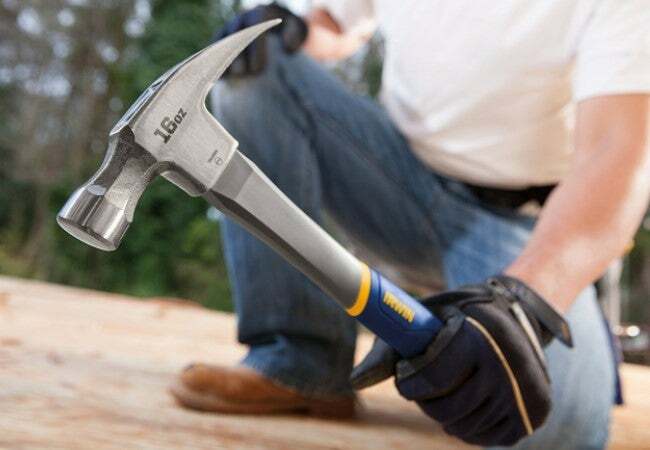 Curved claw hammers are most favored by homeowners and casual DIYers thanks to the pronounced curve of the claw, which makes it easy to pry nails without damaging the surface. 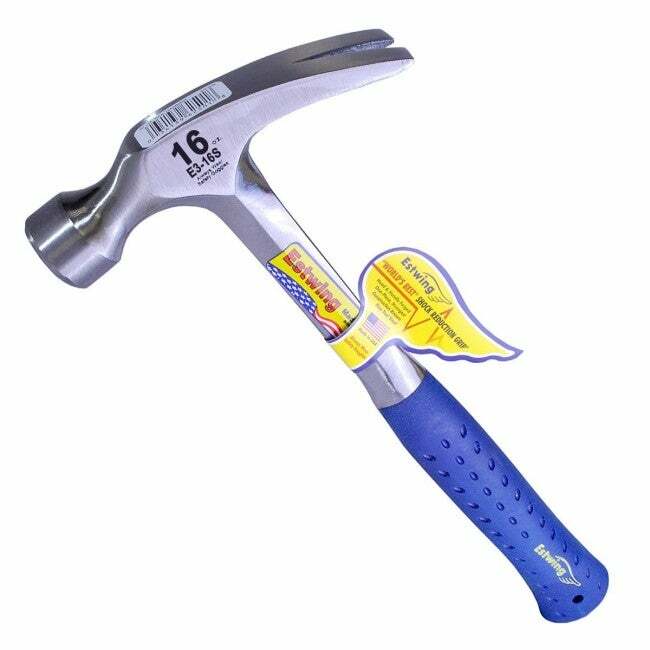 And because curved claw hammers tend to be a little lighter and shorter than rip claw hammers, they’re great for small jobs around the house, such as hanging pictures, minor repairs, and simple carpentry projects. Rip claw hammers have a fairly straight claw, which makes them ideal for demo—“ripping” apart boards that are nailed together, tearing up flooring, or forcefully separating nailed surfaces in other projects. You can also remove nails with the rip claw, but not quite as easily as with a curved claw hammer. Most serious DIYers and construction pros rely on a rip claw hammer, which is generally heavier and longer than a curved claw hammer. Your hammer should feel comfortable in your hand, provide good enough grip to keep it from flying out of your grasp during your swing, absorb shock so your wrists don’t give out, and not shatter during a strong blow. While both steel and fiberglass handles are sturdy enough to absorb the force of hammering, the materials have their differences. Fiberglass is lighter than steel and also better at absorbing vibration and shock that otherwise would hit your hands. Steel handles tend to be more durable and capable of delivering a mightier blow. If you’re tackling framing and other major construction projects, choose a hammer that’s solid steel from head to toe; the sturdiest hammers used by professionals are one piece of forged steel all the way down, making them quite heavy super strong. Wooden handles are common on inexpensive hammers, but although they do absorb vibrations and shock to your hands, they are also far likelier to split or break than steel or fiberglass. 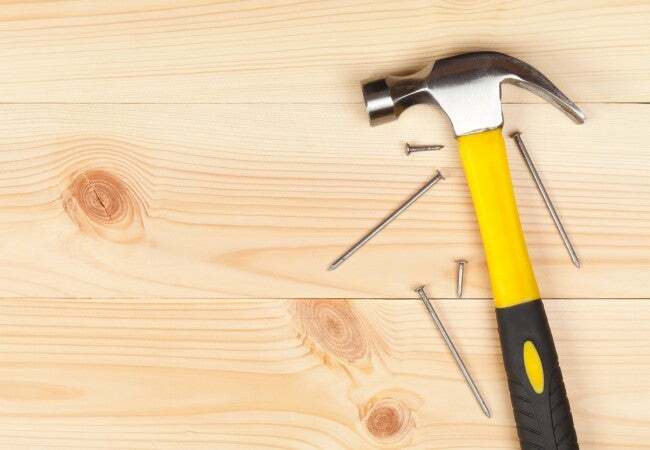 Unless you’ll only use the hammer for knocking nails into drywall to hang pictures or similar light household tasks, it’s best to pass on wood-handled models. A good grip gives you better control of your hammer, especially if your hand is sweaty, making you less likely to smash your thumb instead of hitting the nail. Steel and fiberglass hammers all have some sort of grip; wood-handled hammers often don’t have a grip. On most hammers, the grip is a rubbery synthetic that provides cushioning while absorbing shock from the blows. Leather is another option, although you’ll pay more for it, and it’s likely to stain or darken over time. Weight is one of the most crucial factors when choosing a hammer. Too heavy and you risk muscle fatigue as well as injuring your wrist. Too light and you won’t have enough oomph to really hammer the nail home. Most DIYers and homeowners who do odd jobs around the house, a hammer weighing between 16 and 20 ounces is ideal. Go towards the lower end of that range for simple household tasks and towards the higher end if tackling framing or other larger projects. Hammers weighing as much as 32 ounces exist, but these are made for professional construction workers. The longer the hammer, the longer the potential swing, which builds up more momentum for a harder blow—so a construction pro may want to wield an 18-inch hammer on the job site. Most homeowners and DIYers taking on such tasks as fencing, building furniture, or repairing cabinets should find a hammer between 12 and 14 inches long sufficient. Go even shorter if you don’t have a lot of upper body strength. Remember—the longer the hammer, the more it will weigh and the harder it can be to control. Some hammers are designed to minimize vibration and shock to your wrist, hand, and lower arm. While this is a plus if you use your hammer for extended sessions, it’s probably not necessary for occasional small jobs around the house. 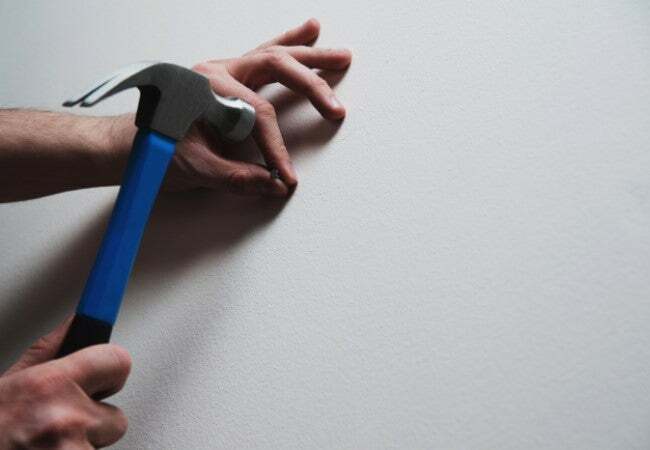 A nail starter is a small groove and magnet to hold a nail in place on the hammer’s head, making it easy to start driving the nail into the board or wall without putting your fingers in harm’s way. Hatchet-styled handles are a current trend. Instead of the traditional straight handle with a slight flare at the bottom, hatchet-styled handles are slightly curved for a more natural grip, and have a bit of a point at the base, rather than an overall flare. Not only do the following tools meet our recommendations above, but consumers rate these three options the best hammers of the bunch. It always hammertime with these DIY and homeowner favorites! Whether you’re hanging a picture, nailing fence boards, or building a doghouse, the Estwing Rip Claw 16-Ounce Hammer will prove up to the task. It’s solid forged steel with a shock-absorbing grip and a smooth face that won’t mar your wall should you miss the target. It has an impressive average of 4.8 stars on Amazon, where satisfied customers praise the sturdy materials, comfortable grip, and excellent balance. If 16 ounces is too much or too little, the hammer is also made in 12-ounce and 20-ounce weights. Available on Amazon. The Irwin Tools 16-Ounce Fiberglass General Purpose Claw Hammer has a hatchet-styled, fiberglass handle with a comfortable grip designed to absorb vibration and shock while reducing fatigue. With a forged steel, smooth face and a rip claw, this is a great hammer for projects both big and small and is sturdy enough for years of use. Pleased Amazon buyers give it a 4.6-star average. Available on Amazon. Unless you’re a professional contractor, you don’t need the brawniest, costliest framing hammer on the market. This well-priced model from a beloved, DIYer-friendly brand can deliver all the wallop most of us would need, thanks to a 22-ounce head and 17-inch, forged steel construction. What makes it a standout favorite for average homeowners? 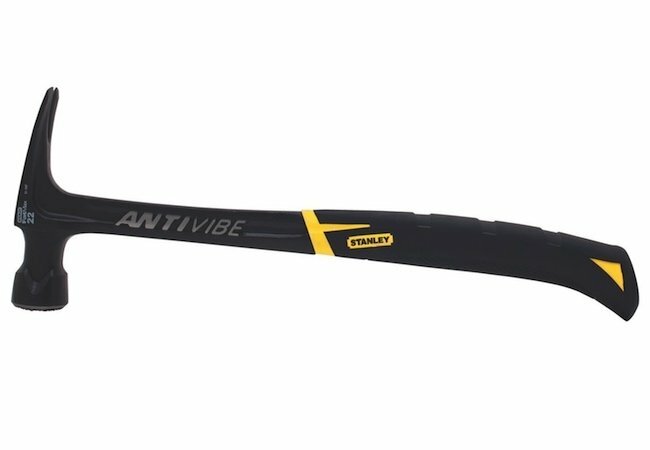 Reviewers say the torsion control and “AntiVibe” features of the Stanley Fatmax Xtreme go a long way to minimize the shock of impact and the associated physical strain. Available on Amazon.